Today we went for a hike at the MacRitchie Reservoir. It's the nature reserve which is right in the middle of Singapore, all jungle basically and I think it's a National Park or something too. 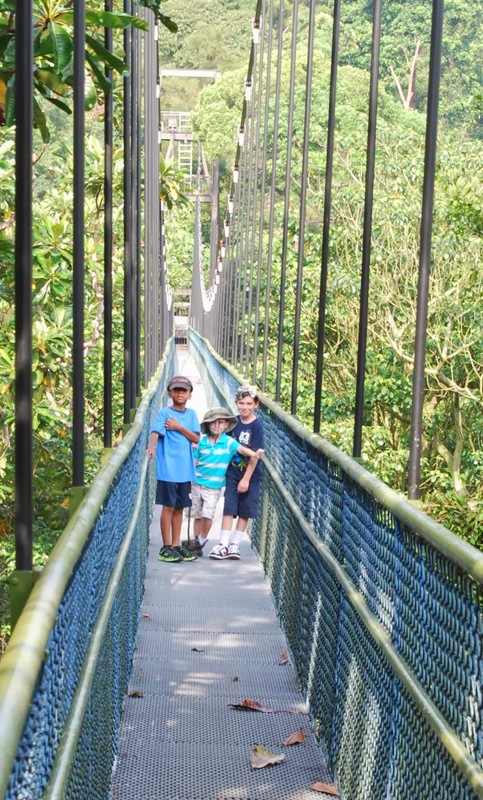 Anyway, we went on the Tree Top Walk trail and it was a fun outing. You can drive your car (if you have one) to the parking lot and hike up and around several trails. As you'll see in the pictures below, the trail we chose to go on has a suspension bridge kind of like the ones you see in the cartoons where it's really high up, in the tree tops! The view was incredible and it was a really neat experience. I'm glad I lugged my big camera along for this one! The boys did such a good job of walking and enjoying nature. They never complained about walking or the heat or anything, I was so proud of them. We all had a lot of fun. The friends we went with have been doing the geocaching thing. If you aren't aware of what that is, I'll quickly explain. Geo caches are found everywhere. You basically choose some coordinates and hide a treasure. You register your treasure as an official geocache and leave the coordinates for other people to find. If you're searching, you see the coordinates and use a GPS to find it. As you may know, GPS signals can vary depending on weather and other factors but can be pretty accurate. Today our friend noticed that there was a cache somewhere near our hike. He kept his GPS open on his smart phone and when we got within 3 or 4 meters of it we started looking. It took us around 10 minutes to find it but it was pretty cool. I knew Ryan would love the whole thing because he's always been so interested in maps and things. We saw a seashell inside of it and traded it out for a mummy key chain which we got at the ArtScience museum here in Singapore. We didn't have a pen to leave our names but I plan to use this in our homeschooling next week. Who knows, maybe we'll really get "in" to this too! Giant ant. Not sure if you can see it there by Ryan's shoe or not, but trust me, it was HUGE! Evan carried this stick all the way through the hike. He was kind of sad that I didn't let him bring it home. We compromised on taking a photo of it. Ha ha ha!